My Chicken Rosemary Rigatoni is a hearty and tasty dish that’s wonderful for a weeknight meal or even a special Saturday night dinner. 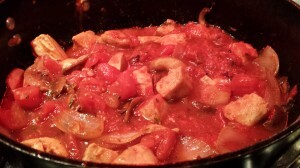 Sauteed cubed chicken breasts, onion, garlic, crushed and diced tomatoes, mushrooms, white wine, and rigatoni come together for a filling main course. A touch of fresh rosemary is what really makes this dish stand out. I grow my own rosemary in my outdoor potted kitchen herb garden. 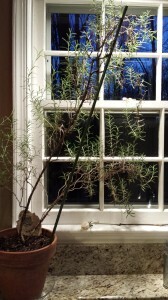 One of my rosemary plants is well over 10 years old, and comes inside the house to spend its winters. Right now, it’s on my kitchen counter in front of a sunny window. 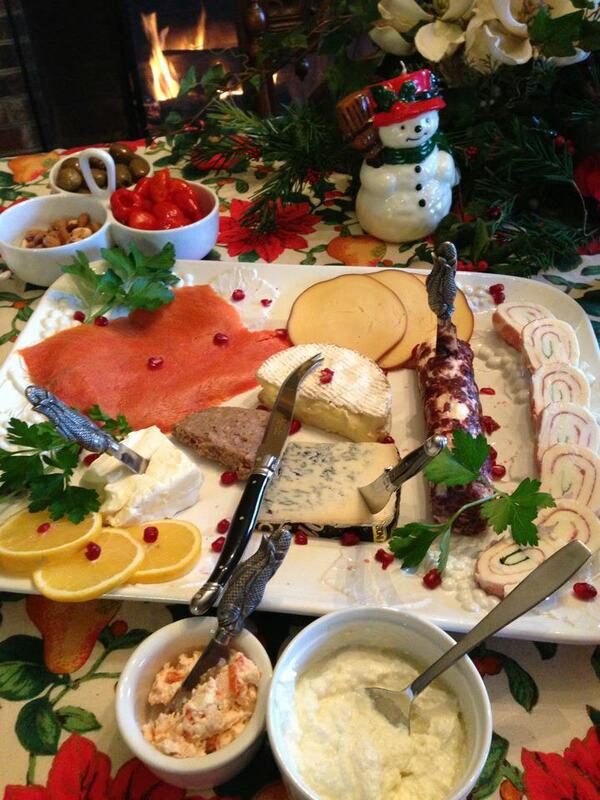 Serve this dish with a nice light red wine such as a Beaujolais and some hot crusty bread. Garlic toast compliments the pasta as well, and you could serve a dry white wine instead of red. And of course, along with my usual “eat your veggies” lecture, a green salad is a healthy accompaniment. 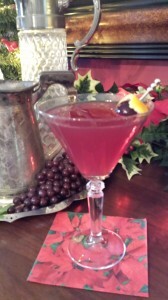 You could try a Caesar if you want to indulge. 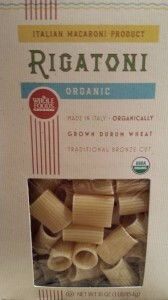 I like to use Whole Foods’ organic rigatoni. 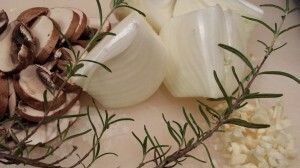 Chop some garlic, cut half an onion into four quarters, slice some mushrooms, and chop some rosemary leaves. 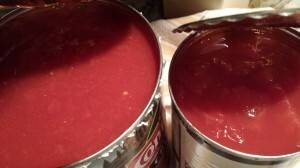 Open some canned diced tomatoes and crushed tomatoes. Warm some olive oil and butter in a pan. 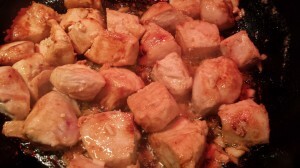 Saute the chicken pieces over medium heat until they are browned on all sides. Add some garlic and stir. 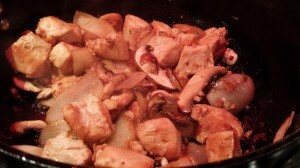 Remove the chicken and garlic from the pan onto a plate. Cover the chicken with foil and keep warm. Add the onions to the pan and saute until the onions are slightly caramelized, scraping up the brown bits on the bottom of the pan. 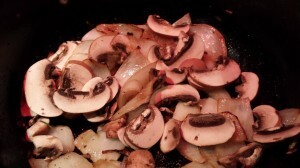 Add some sliced mushrooms and saute a few minutes. Return the chicken pieces and garlic to the pan. Deglaze the pan with some white wine. Add all of the diced tomatoes and half of the crushed tomatoes along with the rosemary and some concentrated vegetable stock. Stir the mixture and turn down the heat to low. Add 1 cup of water and simmer the mixture until it reduces a bit. 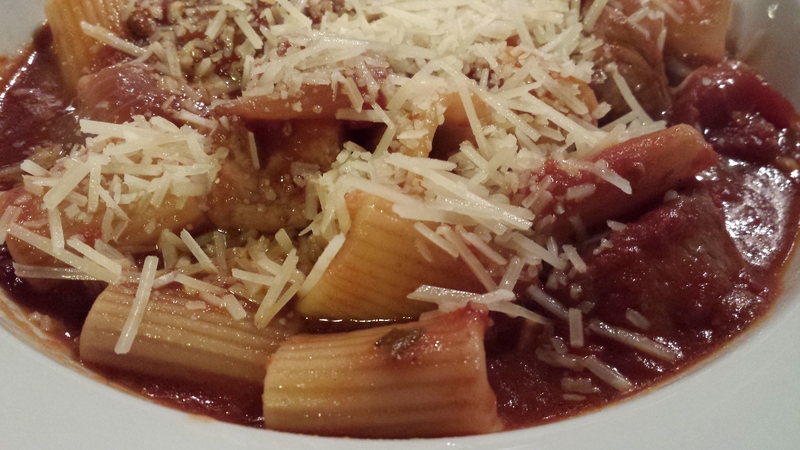 In the meantime, cook some rigatoni in boiling water in a stockpot until the rigatoni is al dente. Drain the rigatoni and add to the chicken and sauce. Stir the mixture together and warm through. Top with shredded Parmesan cheese and serve! 1. Cook the rigatoni according to package directions. Drain, rinse, and set aside. 2. In a large chef’s pan, warm the olive oil over medium heat. 3. 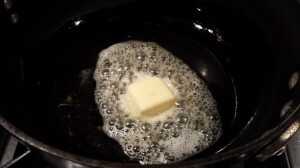 Add the butter and melt until mixture sizzles. 4. Saute the chicken pieces in the olive oil and butter until chicken is golden brown and cooked through. You may need to saute the chicken in batches depending on the size of your pan. 5. Add the garlic and sauté for about 1 minute. 6. 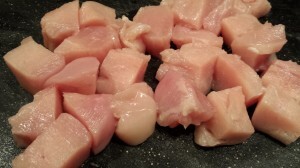 Remove the chicken and garlic pieces and place on a plate. Cover with foil and set aside. 7. 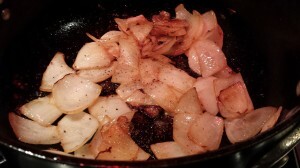 Add the onion to the pan and sauté in the pan drippings until onion is transparent. 8. Add the mushrooms and sauté for a minute or two. 9. Return the chicken to the pan. Add the white wine and deglaze the pan, scraping up the brown bits from the bottom. 10. 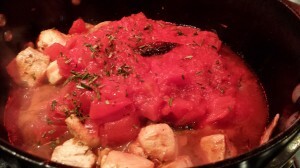 Add the diced tomatoes, crushed tomatoes, rosemary, and vegetable stock. 11. 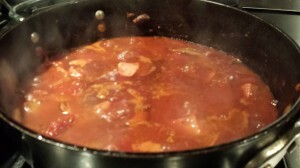 Add one cup of water and simmer for about 20 minutes over low heat, uncovered, until mixture is slightly thickened. 12. Add the cooked rigatoni to the mixture. 13. 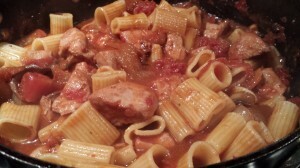 Toss ingredients together in the pan to coat the rigatoni, and heat through. 14. Season to taste with salt and pepper. 15. 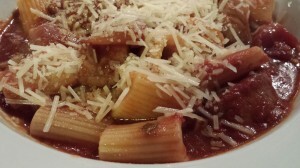 Serve with freshly grated parmesan cheese sprinkled over the top of the pasta. Makes 4 servings. Serve with a side salad and crusty bread. Either white or red wine go well with this dish. Variations: Can substitute water or additional crushed tomatoes for the white wine if you prefer. 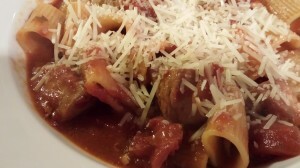 Also, you can wait to cook the rigatoni pasta until the sauce is simmering. Chicken sausage can substitute for the chicken breast pieces. 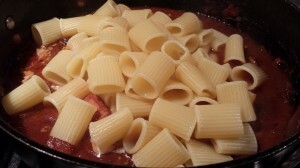 Another option is to cook the rigatoni only part way (half to three quarters) and make a baked casserole dish. 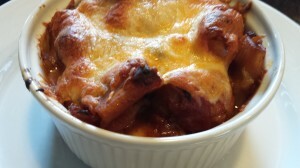 You can bake the partially cooked rigatoni and sauce in a large baking dish or in individual ramekins. It’s also a great way to use any leftovers. Just top with your favorite cheese and bake at 350 degrees Fahrenheit for 30 minutes or until the cheese is melted and the pasta sauce is bubbling.